Today marks the last day for the art therapy photo documentary Spaces & Places: Where We Create, an online project that Magdalena Karlick and I launched back in February inviting art therapists, art therapy students, and art organizations to submit digital pics and descriptions about the creative spaces they work & create in, as well as favorite or common materials and media used. Over the last 4 months it has been a pleasure to see this project unfold…with wonder, inspiration, motivation, and connection. Over 200 photos from Italy, India, Canada, Singapore, New Zealand, the US, Hong Kong, Mexico, and Australia were shared via The Art Therapy Alliance community on Facebook, through Flickr, and posted on the go with Instagram. I’ve enjoyed experiencing through with project and its collection of photos where art therapy happens, art materials that are offered, and the creative spaces we make our own art. Equally enjoyable for me has been the connection the photos have inspired. Through the power of social media, there’s been many supportive exchanges & interactions in the form of sharing, tweeting, liking, or commenting that have helped foster community, connection, and creativity. More to come soon from Magdalena and I on the Art Therapy Alliance’s posterous, as we share our reflections and thoughts regarding Spaces & Places: Where We Create. A big thank you to Magdalena for co-organizing this project with me, the project’s endorsers, and to each and every art therapist, art therapy student and organization who contributed photos and shared their Spaces & Places. I invite you to take the time to view all the photos, comments, and connection inspired by Spaces & Places: Where We Create here on Facebook. 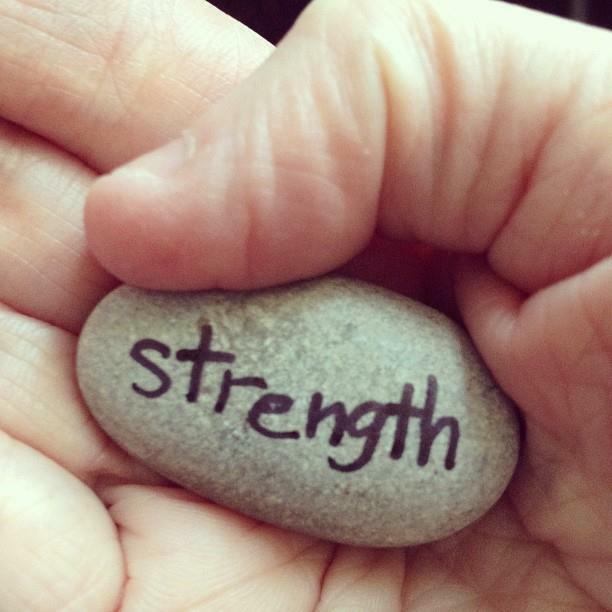 For many of my last group sessions, but especially for this children’s trauma & loss group because it helps reinforce themes related to resiliency, I like to spend some time focusing on an experience I introduce as “Stones of Strength”. 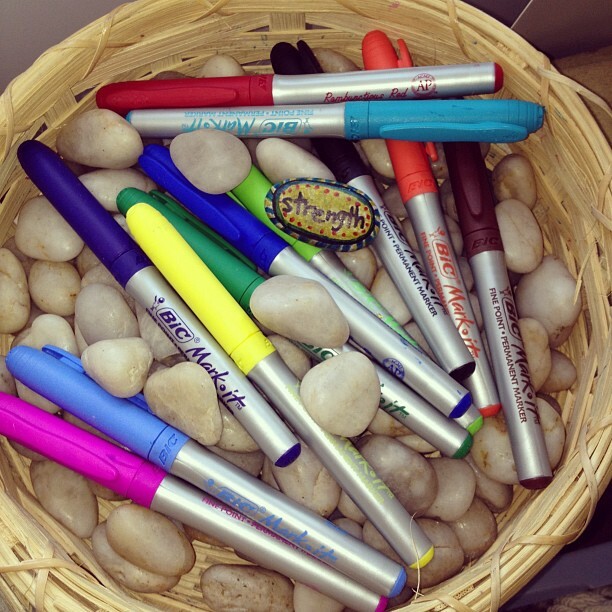 Each child has the opportunity to select their own personal stone to embellish, make his/her own with permanent marker and by writing one word on the surface that brings him/her feelings of comfort and safety. The stone can then be used as a tangible, creative, and personalized reminder to keep and use for coping in times of worry, stress, or difficult days. A batch of stones from the photo below were creatively developed & dedicated by this group of 6-12 year olds for kindness, love, friendship, and hope, to just to name a few. 6 Degrees of Creativity 2 Now On Sale! Today’s the day that 6 Degrees of Creativity 2 goes on sale! Stitch Therapy – Fiber Art Painting: This workshop explores using fiber art as a method for personal awareness and healing. Let me show you my process and techniques for creating a fiber art painting using new and recycled materials to create order from chaos and put together scraps and bits of everyday life. This workshop will explore themes of repairing & layering – slowing down, enjoying to relax and engaging in a meditative process to feel the materials and hear them as you pierce the fabric with a needle and pull thread through. Through this process you will be invited to take time, listen, and feel. Instructor: Kelly Darke attended Parsons School of Design after high school where she completed the first year core classes before deciding to move back to Michigan and attend Wayne State University where she graduated with a Bachelor in Fine Arts with concentrations in painting and metals. Kelly later returned to Wayne State University to complete a masters degree in Art Education for Art Therapy as well receiving a K-12 art education certificate. Kelly now works as a Registered Art Therapist in Westland, Michigan as well as a professional artist, combining her passion for fine art and art therapy into her current work. Kelly also works in collaboration with her brother / artist Colin Darke on group projects that have most recently been shown at LaFontsee Gallery during Art Prize 2010, as well as regularly showing her work in galleries. For more about Kelly’s work, please visit herwebsite and blog. The Altered Image: Hands-On Photo Manipulation: This fun and inspiring workshop will show you how to change the surface of a photo by hand, rather than with technology. Steal yourself away from your computer and come home to your art table! Through a guided process you will learn how to use simple art materials to alter a photo by changing the content of the image. This technique has lots of potential and can be applied to photos that are used within paintings, drawings and visual journals. It’s a great process for personal reflection, as well as for use in therapeutic settings. 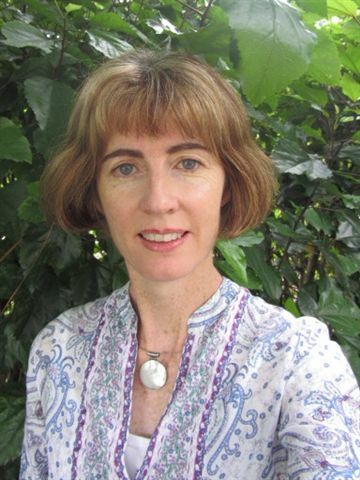 Instructor: Fiona Fitzpatrick has worked as a registered Art Psychotherapist for the past 12 years in Sydney, Australia. She is passionate about the power of art therapy to help people explore and work through issues of concern. Her particular interest is in working with cancer patients and their families. Alongside her clinical work, Fiona also teaches popular one day courses in both Art Therapy and Visual Journaling through Sydney University. She has used image making and writing within a journal format for many years. Fiona is really looking forward to bringing a sense of fun, encouragement and possibility to the 6 Degrees of Creativity community. Through a combination of themes and prompts, we’ll embark on a 21-day commitment, cultivate a feeling of positive and playful engagement and create an art-making practice within the safe community of 6 Degrees of Creativity. Instructor: Hannah Klaus Hunter, art therapist for the UC Davis Children’s Hospital, holds a B.A. in Studio Art from the University of Iowa, an M.F.A. from California College of the Arts and a Post-Master’s Certificate in Art Therapy from UC Berkeley. She specializes in children and young adults impacted by chronic illness, grief and loss, drawing inspiration and regeneration from her studio practice in watercolor, quilting and collage. 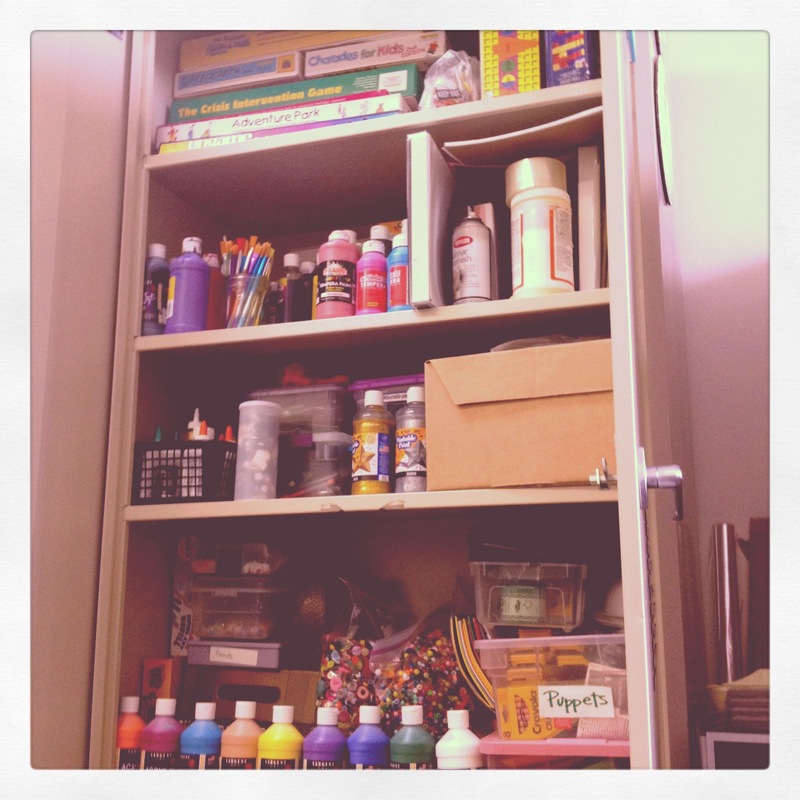 Hannah shares her reflections on art making in and out of the studio on her blog here. Journey Shoes: We have walked in many shoes, witnessed others on many paths, and have wished for paths to form for ourselves, loved ones, and social and global issues. This project encourages exploration of a journey or two of choice, either imagined or experienced. Through altering one’s own shoes, or used shoes from a Salvation Army-type store, participants will weave, cut, paint, plaster, and glue symbols and expressions of these journeys onto and with these shoes. Instructor: Magdalena Karlick graduated from New York University with a BA in Community Learning and Development and received her Masters in Art Therapy at Southwestern College. Magdalena is an Art Therapist in Santa Fe, New Mexico working with families, children, and teens, many of whom are court ordered. At Southwestern College Magdalena has multiple roles; she is the assistant to Southwestern’s Art Therapy Director, an adjunct faculty member teaching Current Trends in Art Therapy, and created and moderates SWC’s online Art Gallery blog. Magdalena is also co-creator of Spaces & Places: Where We Create, an art therapy community photo documentary project. An active and dynamic visual artist as well, Magdalena creates works ranging from deeply layered multi-media paintings, jewelry, to sand tray figurines. She really enjoys black ink pen the best though, using an unconscious journey with her hand, pen and paper, always leading to interesting messages shown through animals and imaginal landscapes. Creative Goodness with Gluebooks: This workshop invites participants to learn about the creative goodness of gluebooks! Gluebooks combine art journaling and collage: all you need is a book/journal, some glue, and stuff to glue. Participants will be introduced to simple, yet unique ways that gluebooks can be created with repurposed materials. This workshop also includes an exchange organized by Gretchen of gluebook pages created by participants of the 6 Degrees of Creativity community, a paper stash swap, collage sheets to download/print for gluing inspiration, and fun ways to develop, collect, and use your paper stash! Instructor: Gretchen Miller is a Registered Board Certified Art Therapist and who practices in Cleveland, Ohio specializing in youth, women, and families impacted by trauma, domestic violence, and grief & loss. Gretchen is a community organizer forThe Art Therapy Alliance and currently serves on the Board of Directors for Art Therapy Without Borders. In her own art and creative process, Gretchen enjoys finding inspiration, creating energy, and discovering transformation through working with mixed media, painting, collage, altered art, creating handmade books, organizing art exchanges, and collaborations. Her blog Creativity in Motion frequently highlights her art, interests, and creative activity. Feeling Your Art-Exploring Texture and Process: When was the last time you gave yourself complete permission to simply play with art materials and get lost in the exploration process? Textural art naturally entices viewers and artists alike and invites interaction and spontaneity. In this workshop you will be introduced to a variety of techniques for creating texture in your art using acrylic mediums, modeling pastes, gels, and palette knives. You will create textural ‘playgrounds’ for your paint to travel through with the layering of textures, colors, found objects, and any other materials that inspire you. The experimentation process with texture will be framed by suggested ideas and directives that are designed to delight and inspire the eternal child within you. In this workshop, the process and play drive the work of art. 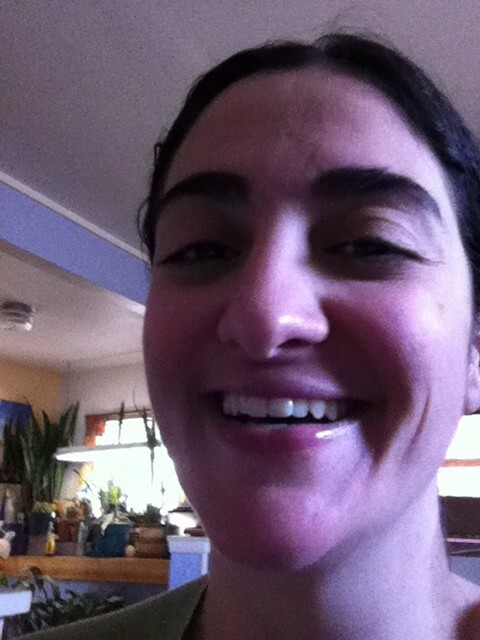 Instructor: Sara Roizen is an artist and art therapist living and working in New York City. She holds a BFA in Painting from the Rhode Island School of Design and a Masters in Art Therapy and Creativity Development from Pratt Institute. Most recently, Sara has focused her art therapy work with adults living with HIV/AIDS, substance use, and mental health issues. Sara’s personal artwork draws inspiration from the natural world and the organic process of art-making. Her current mediums of choice are acrylics, watercolor, ink, modeling pastes, and found objects. Sara shares her insights on art therapy, personal art making, mental health, mindfulness, and spirituality on her blogwww.ArtTherapySpot.com and some of her current art work can be seen atwww.sararoizen.com. I’m very excited to be working with this amazing line up of instructors! 6 Degrees of Creativity 2 is on sale now until June 30, 2012. Learn more about what 6 Degrees of Creativity is all about here. All 6 workshops are only $49.00 (USD). Join us!!! 10 months, 1,000+ pins, 23 boards, and lots of hours later, I continue to be addicted to Pinterest more than ever. It was around May 2011 when I was first introduced to this digital pinboard site and social networking community that continues to grow in major popularity and users everyday. I’ve enjoyed not only all the pinning, re-pinning, cross pinning on Facebook or Twitter, board surfing, and connecting, but also understanding more about Pinterest’s potential as an educational, advocacy, and learning resource to visually organize, collect, and share ideas, information, and projects from and with like minded others actively engaged in the community. I’ve recently added my love of art therapy, community organizing, and social media with The Art Therapy Alliance into my Pinterest activity, as well as my interest in trauma intervention with creating a Trauma Informed board that includes resources, ideas, and finds related to books, projects, organizations, and infographs related to trauma informed care and practice. For me, this board is a nice way to share and organize trauma related information related to my professional work. Click on the board below to check out some of my pins collected so far! And…. I am still sending out invites to join Pinterest if anyone needs one to get started- just let me know! I would also love to connect to others on Pinterest doing trauma work, so feel free to let me know about this too if you are interested in connecting. It’s exciting to announce a new art collaboration coming in February being organized by The Art Therapy Alliance! 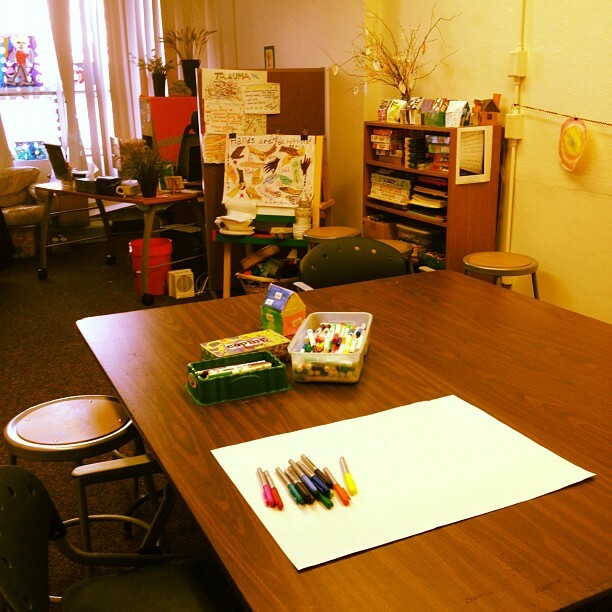 Spaces & Places: Where We Create will be an art therapy community photo documentary project developed by me and Magdalena Karlick, ATR, LPAT, LPCC inviting participants to submit a photo of their creative work space and favorite tools of the trade. Through social media and digital photo sharing with Flickr & Instagram, this collaborative project aims to provide education, awareness, inspiration, and understanding about the spaces & places, settings, populations, and materials that art therapists, art therapy students, expressive arts therapists, and art organizations work in and use for their practice. Submission guidelines and more details to be announced when the project officially launches next month! Information will be posted to the Spaces & Places: Where We Create project page February 13. We are also looking for organizations, programs, and blogs interested in becoming an endorser of this project. Feel free to contact me via info@arttherapyalliance.org for more information. The Art Therapy Alliance is proud to be partnering with Art Therapy Without Borders and International Art Therapy Organization for this new project, with endorsement by Southwestern College, PeaceLove Studios, Art Therapy Institute North Carolina, and Sock Monkey Art Therapy. If you want to receive updates and news about the project, RSVP to the project’s event page on Facebook. Yay to a new art therapy collab for 2012! Get your camera ready! It’s finally open! Check out this blog post on The Art Therapy Alliance’s posterous about the official launching of 6 Degrees of Creativity. Yay! It’s been an exciting, energizing, and inspiring time on my end getting members set up on the site and welcoming them to this new community full of opportunities for creative goodness, connection, and collaboration through art making and social networking. Love! Much, much gratitude and love to 6 Degrees of Creativity instructors Kristina, Lani, Cathy, Jen, and Kat for their workshop contributions, energy, hard work, and participation to help support my vision for this. I am really looking forward to what this experience will bring over the next 6 months. Stay tuned for more as I post my own art and creative reflections from all the workshops- and of course share some of the happenings within my Artist Trading Card workshop and exchange. Lots to enjoy, create, and have fun with now until March! What are your 6 Degrees of Creative Goodness? Video filming is almost finished for my Artist Trading Card (ATC) workshop & exchange that I am offering as part of the 6 Degrees of Creativity experience opening this fall. My workshop will include a series of videos introducing the ATC concept, material considerations, examples, and exploring the theme of 6 Degrees of Creative Goodness. This theme will empower participants to reflect on and create 6 ATCs about the role of creativity as a meaningful practice in our life, work, and relationships, including the opportunity to share and receive more creative goodness in the workshop’s ATC exchange. Between now and early October, I am looking forward to finalizing the 6 Degrees of Creativity site and opening these virtual doors on October 10. Over the past few weeks I have been humbled and inspired by the kind notes of interest, support, and encouragement around launching this new community and experience. Thank you! I am also honored to be working alongside an awesome group of colleagues: Kristina Bell DiTullo, Lani Gerity, Cathy Malchiodi, Jenny Navarro, and Kat Thorsen who will be teaching an amazing line up of workshops focusing on concepts and art-making about transformation, social change, and more creative goodness! Only 10 more days until 6 Degrees of Creativity goes on sale via The Art Therapy Alliance website… Wow! As revealed today via The Art Therapy Alliance’s posterous, the workshops for 6 Degrees of Creativity have been announced! Check out what will be offered, the descriptions and get ready for some creative goodness beginning October 10 until March 1, 2012! The instructors for this offering have planned some inspiring concepts, techniques, and hands on art making ideas to explore transformation, social change, and using art for good! In addition to organizing this, I am excited to be offering a workshop too! I’ll be offering 6 Degrees of Creativity to celebrate the creative goodness in your life, work, relationships, & daily practice with the creation & exchanging of 6 Degrees of Creative Goodness Artist Trading Cards. My workshop will include an exchange of ATCs created in this workshop with other class participants to ultimately create a Creative Goodness Miniature Book inspired by the 6 Degrees of Creativity community. All six workshops in 6 Degrees of Creativity go on sale September 1 for only $49- Check them all out here! I hope you make plans to join us! I’ve been planning and prepping for this announcement for weeks! It is so very exciting to finally share the news… As announced on The Art Therapy Alliance’s posterous earlier today, save the date for my next interactive community collaboration: 6 Degrees of Creativity. 6 Degrees of Creativity is inspired by the “Six Degrees of Separation” concept that each of us, no matter where we live in the world are only about six relationships away from one another, as well as features the power of social networking, the arts, and interactive creativity to making a difference through art-making, creative goodness, and community. 6 Degrees of Creativity is a 6 month on-line workshop opening October 10, 2011 and running until March 1, 2012 that will include 6 different workshops, offered by a group of 6 inspiring instructors from the art therapy community to explore hands-on concepts, techniques, and ideas related to themes about transformation, social change, collaboration, and using art for good. Because 6 Degrees of Creativity is a virtual workshop, this offering can be done at your own pace. You can participate from anywhere in the world, anytime, and on your schedule, whether it is on your laptop, notebook, desktop, or even on the go via your mobile device! Workshop content from each instructor will include PDFs, video tutorials, written instruction, photos, art sharing, and on-line chats that will be available within the 6 Degrees of Creativity community during the entire run of the workshop. 6 Degrees of Creativity includes a social networking community to share creative goodness, discuss & support ideas, and deepen connection. You can learn more information about each instructor and their interests via the Art Therapy Alliance website. Workshop descriptions will be announced in early August. 6 Degrees of Creativity goes on sale September 1, 2011. All 6 workshops will only be $49! Save the date, stay connected, and make plans to join us for lots of art-making and creative goodness!